This page is for the original game. 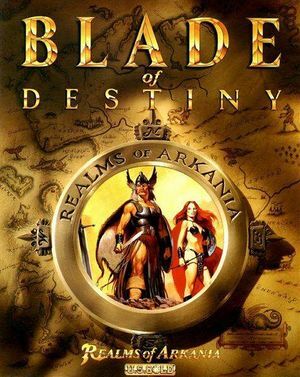 For the 2013 remake, see Realms of Arkania: Blade of Destiny (2013). Floppies or CD-ROM. Use DOSBox. Includes Realms of Arkania: Star Trail. Pre-packaged with DOSBox. The German version needs the manual to answer copy protection questions (see passcodes.pdf for GOG.com). Go to the end and delete the intro line. These steps upgrade the English version with the German version's CD music. This requires the German CD version (GOG.com has both). This reinstates the copy protection questions; refer to passcodes.pdf in the German version's installation folder for the answers. Download and install both the English and German versions of the game to their individual folders. Go into the English installation folder. Go to the German installation folder. Copy the German MUSIC, game.gog, game.inst, INTRO.EXE, SCHICKM.EXE and SOUND.CFG to the English installation folder, replacing existing files when prompted. In the English installation folder rename SCHICKM.EXE to BLADEM.EXE. 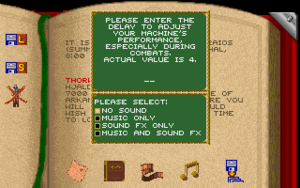 Edit the English version's dosbox_realms1_single.conf. Make a new line below mount C "..\Realms of Arkania 1". Save your changes. The game will now have CD music. GAMES.NAM stores save game names; saves can't be accessed if this file is missing. Generated characters are *.CHR; character files are not needed for loading save games (characters are stored in each save). No volume sliders; on/off only. Fan translation by «ZoG Forum Team».